I’ve never done one of these before, but I thought that perhaps I should start. I want to start figuring out regular posts for specific days of the week, so this seemed like a logical place to start. I hope you guys like it and let me know if there are any features, memes or series you’d like to see me undertake weekly! I read Fangirl and completely fell in love, so of course, when I found out that Carry On was essentially Cath’s fanfiction in proper book form – I wanted to love this book. While I did enjoy myself, it wasn’t quite as good (for me) as Fangirl. Read my review here. I love Simon so much, so it was fantastic to get to spend more time with him in this collection of novellas. There so much history, lore, and worldbuilding in each of Cassie’s books that I believe that you need to read them more than once to get everything out of them. I know I re-read her novels and catch something new, or make a connection that I hadn’t before each time. Read my review here. I fell in love with this book all over again as I re-read it this week. To be honest, I probably love it even more than the first time I read it. You can just see how much Cassie has improved as a writer over the course of her novels. The world building and the plot in this book is fantastic. Read my review here. Oh my gosh. I just don’t even know right now. It’s amazing and I’m a little over halfway through, so I can’t imagine what else Cassie is going to put me through emotionally. I’ve read this before, but I wanted to brush up on my Shadowhunter knowledge. 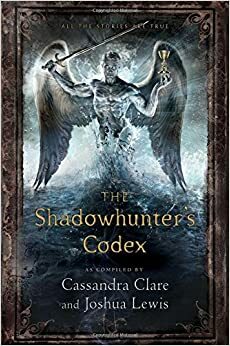 Since I haven’t been able to find any digital version of the Illustrated History of Notable Shadowhunters on Amazon (and my online library states its only available in the UK and New Zealand) – I thought this was the second best option. Maybe one day I’ll be able to find the digital version, or I can buy the physical one when I finally get home. This week I talked about the books that students from Ilvermorny might enjoy. Ilvermorny is the North American Wizarding School that we’ve most recently learned a bit about from J.K. Rowling on Pottermore. I was sorted as a Thunderbird on there, which makes me a Thunderclaw – although I still stand by my Gryffinclaw status. You can read my post here. None yet, but I’m still looking for advice and ideas to add to my list of weekly posts! I was tagged by Mandy over at Book Princess Reviews who recently hit 600 followers, whoooo! This was just a fun tag about things and music that make you happy. Are you surprised that books are on my list? 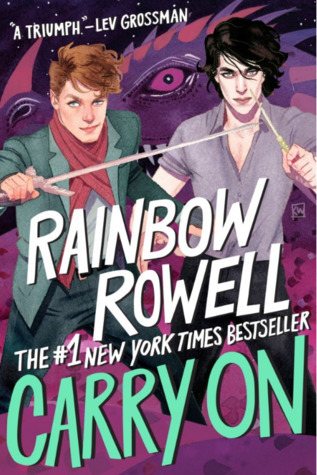 I have heard a lot of mixed things about Carry On but that cover really makes me want to buy it! Oh my gosh yes, it’s gorgeous! I probably would never read it again, but I just want the book.